The Drumbox-01 rhythm machine module introduced in Compositor v6 helps accompanying your Compositor performance with beats of synthetic drum kit. Non-linear snare drum, Frequency Modulation Kick and Hat engines and sampled bass line all suit modern genres of electronic music. The auxiliary channel of Compositor WS Extended suits for multichannel style of work. It consists of 8 decks for truly multithread performance. This way you can create leads, special effects and use them as ether exciters alongside of 129 radio loops in total. The vinyl deck engine is super realistic. It emulates the states of tonearm such as up or down. 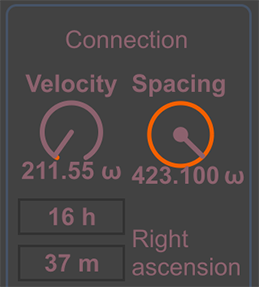 You can apply pitch scaling for track and loops in mechanical mode and set bpm independently of Compositor v6 master tempo. You can control over the Compositor WS Extended performance parameters independently of multiplier. It helps to switch phases, change sequence consistency and note appearance for generative algorithmic broadcast. Compositor v6 loops library extended with 44 hb loops, equaling 129 loops in total. HB loops consist of exciters, which are different from previous loop series in genre and effort needed to showcase them during the live broadcast. Now you can select between reverse engine and normal playback modes by a special toggle situated on Compositor WS Extended front panel. This toggle switches the backward playback to forward playback of Compositor sequence harmonics. The sync function suits the synchronization of loops to master tempo of Compositor v6. You can use it to set the auxiliary channel cores in correspondence to speed of loops regeneration, which helps to pitch the loops playback more equally. It is important for any type of performance to free your hands for improvisational parameters such as changing loop sequence or its spectral balance. With Random and Forward modes, loops will be selected automatically while you can concentrate on live performance. Repeat time enables to play the selected loop or track without interruption for several times. You can repeat file playback for up to 32 times to create multi-hour random arrangements. 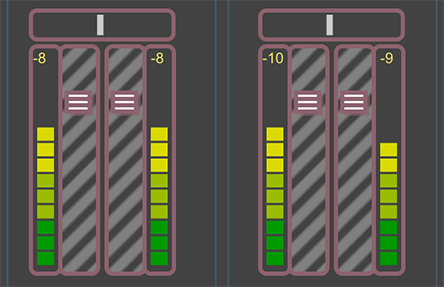 The pitch scale regulator, familiar to all vinyl deck lovers, is implemented on Compositor v6. It has the mechanical engine feeling and you can scale pitch up or down in percent to mix two or more tracks together. In Compositor v6 non-synchronous performance of decks is possible. 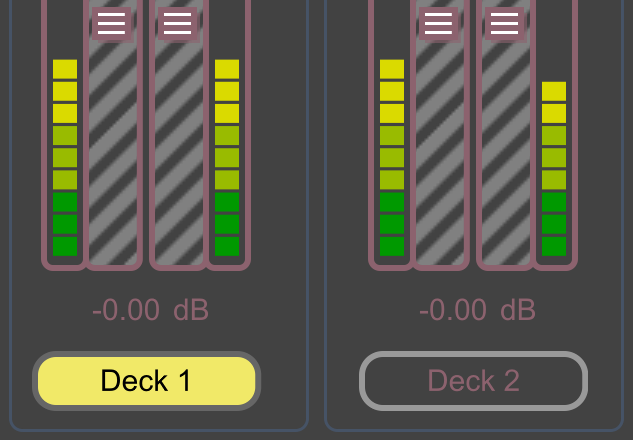 You can set each deck to its own bpm value independently of master tempo control. This way you can set track bpm if you know it in advance and then scale it using deck pitch regulator. 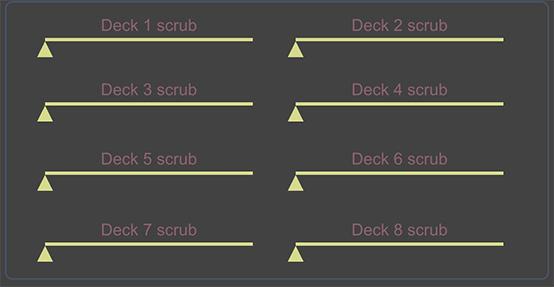 Each deck has its own sample number indicator, which can be used to know the stored memory of each deck. 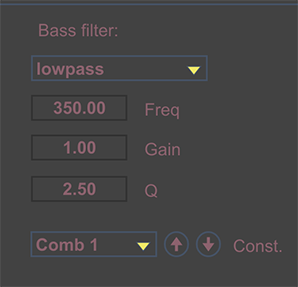 You can use it to determine if the loop is used and its sample length. The function needed for all DJ’s is the track-nudging feature. Using it, you can precisely synchronize the performance of two tracks if the right bpm value and pitch scaling performed in advance. Using the Reset to BS and Reset to TS buttons, you can achieve cueing to the track start and beat start of the current bar. It is convenient, while mixing your tracks, to kick in the reference deck, synchronizing its playback to the main mix with these buttons. With special loop mode counter, you can toggle two bar loops and know their exact beats per minute value immediately. Such method of prediction employs special relativistic counting method implemented for this software. Each deck has its own volume fader and panning for setting the right track balance in auxiliary channel. It helps to perform an auxiliary mix, which you can send to master or for cue listening. 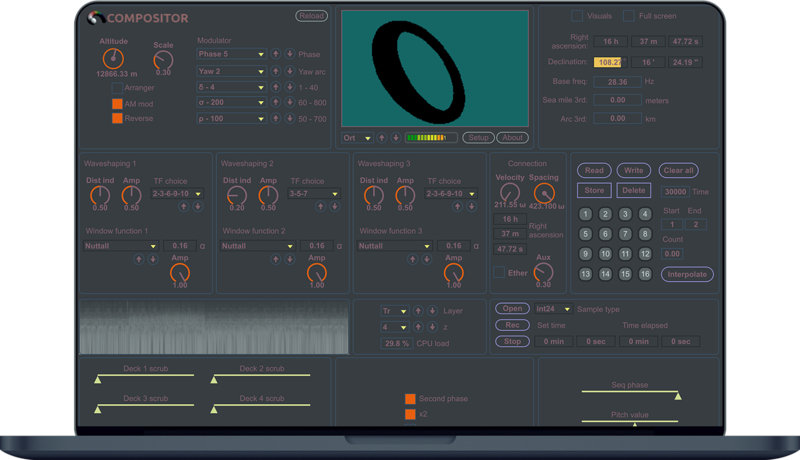 New synthesized drum instruments for Compositor v6 consist of non-linear snare and FM hat modules. 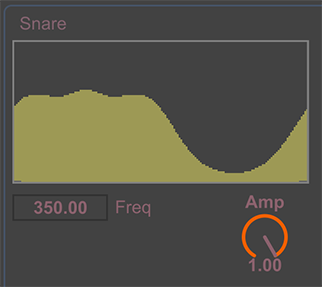 You can also enjoy the wavetable bass synth engine, which scales its pitch in relation to main Compositor WS Extended module z value. Drumbox-01 module consists of what known as Constellations. It uses these Constellations to form a rhythmic pattern of Drumbox-01 instrument. This approach helps to have up to 16 grooves to accompany your loops or Compositor WS Extended sequence. You can choose a track for synchronization using yellow-lit buttons. If the track is selected, it unchecks the synchronization status from all the other tracks and syncs to master tempo of Compositor v6. At the heart of Compositor WS Extended is 8-core engine, which allows independently scrub decks and change their tempo. It helps to perform 8-channel auxiliary listening with precise synchronization. Compositor WS Extended has the direct monitoring and auxiliary monitoring capabilities. It features the latency free aux channel, which helps to establish an aux line for synchronizing your performance to a master tempo.